Home › entertainment › videos › She Hoses Off Her Big Babies. But When The Stallion Does THIS? I Can't Stop Laughing! She Hoses Off Her Big Babies. But When The Stallion Does THIS? I Can't Stop Laughing! As summer begins to hit its peak, more and more people are doing their best to avoid the hot rays of the sun. Along with the humidity, this summer seems like it’s going to be a bad one, and with heat waves rolling in and out, it feels like fall is just way too far away. Luckily for humans, we have the chance to go indoors with a nice air conditioner blowing away, but for many animals all over the country, they’ll have to just deal with the heat and wait for cooler temperatures. Dogs and cats can come inside, but for anyone who has a horse, that’s just not really a possibility! While some people set up fans or even air conditioners in the barn, on those particularly hot days, it doesn’t seem to do much. 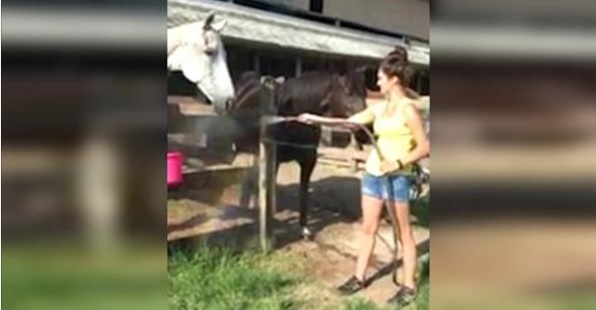 So, one proud horse owner decided she was going to spray her horses with a water hose to help cool them off. And that’s when things got interesting! It was nearly 100 degrees and Sam the stallion was loving the spray of water, but when his human turned to his brother named Uno, he wasn’t having any of it! That was his water, and he wasn’t going to share for a second! His human kept trying to spray Uno off, but Sam is a pretty greedy horse with a pretty silly personality. We had no idea that animals could experience things like greed and jealousy, but it seems like this selfish little stallion fits the bill!